I'm always on the prowl for a good guide book to London, and if it goes into the more violent or disturbing aspects of the city's dark past, so much the better. That's why I was thrilled to find the book Bloody London by Declan McHugh. The cover alone, with the Thames running red with blood, was enough to convince me that this was one book worth checking out. Travel to Aldgate East underground station. If you are coming from the east, turn right on the platform after you leave the train. If you are coming from the west, turn left on the platform when you leave the train. Follow the sign saying "Toynbee Hall -- Way out." You want Exit 2. Exit on to Whitechapel High Street, and turn right. And so on. I really like the explicit "turn right" type of directions. I think even I could manage to find all the places mentioned in this book! The author also helpfully lists pubs and cafes that are close to each location, so that you can fortify yourself before (or after) completing your ghastly visit. Sight-seeing (even the bloody kind) can be thirsty work! The events mentioned in the book range from the location of the Temple Church, the Knights Templar base in England, through to locations of plague pits from the 1600s, down to bars and other haunts of modern serial killers. If the location charges a fee to enter, that is helpfully mentioned, as well as contact information (so you really have no excuse not to add at least a few locations from this book to your next London itinerary!). 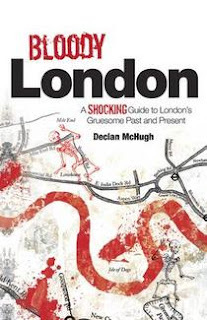 The author, Declan McHugh, offers several popular walking tours of London which you can find out more about from his website, Shocking London. I'm looking forward to visiting some of these creepy sites on my next trip across the pond! Thanks so much for writing such an engrossing book! It's great to read the "inside story" from the experts!